aus verschiedenen Epochen Japans (die meisten Stücke aus der Edo-Periode). 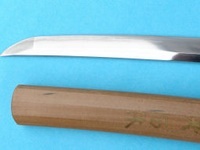 Blade hira zukuri, torii zori. Notare with togari hamon and a few tobi yaki. 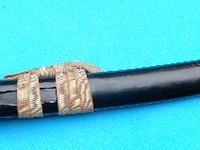 Chu masame hada, boshi o maru with middle kaeri. Kesho polish. 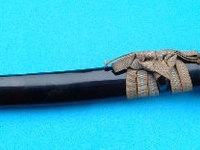 Nakago, ubu, two mekugi ana, kiri yasurime, uninscribed. 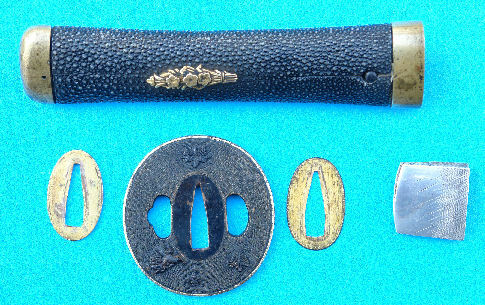 Silver applied niju habaki with nekogaki.Black ishime laquer saya, fuchi kashira of shakudo, on nanako ground various mon in gold. 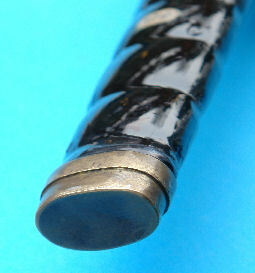 The tsuka fitted with same and mounted with a pair of part gilt blossom menuki, laquered linen wrap. 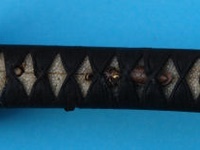 Sentoku mokkogata tsuba with wave design. 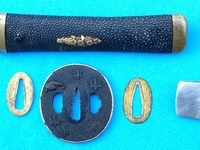 Shirimono kozuka, sashimono, yumi and arrow. 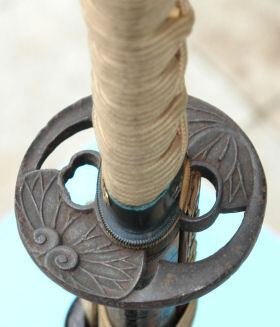 Mounting from the late Edo period. 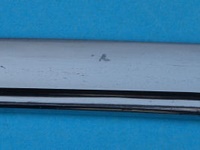 Length k/m 38,5 cm, total length 57 cm. 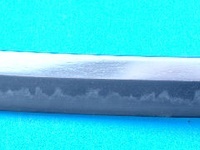 Blade shinogi zukuri, chu kissaki, torii zori. 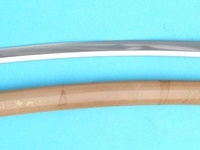 choji midare, togari chji hamon with ashi. 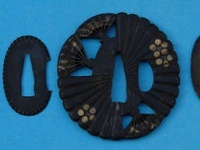 Matsu kawa hada, jizo kaen boshi with short kaeri. 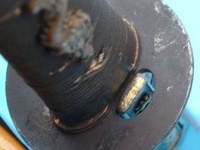 Occasionally minor areas of pitting. 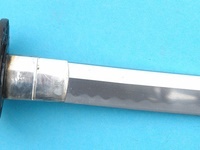 Old kesho polish. 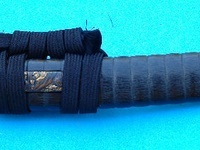 Nakago with two mekugi ana, sujikai yasurime, uninscribed. 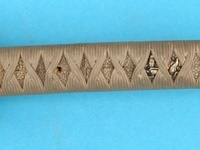 Gilt copper habaki. 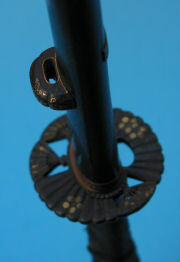 Mounting from the late Edo period. 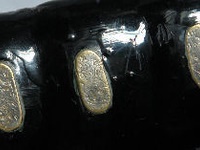 Laquer saya with a surface imitating the bark of a tree and decorated in red and black laquer over gold ground, horn fittings. 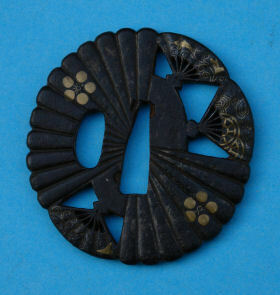 Mokkogata iron tsuba, carved in low relief with a Ghinese riverscape. 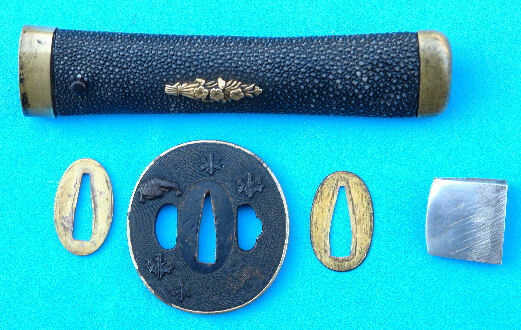 Kojiri, fuchi and kashira of iron with inome and remnants of brass nunome. 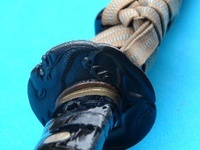 Tsuka fitted with same and black silk cord wrap. 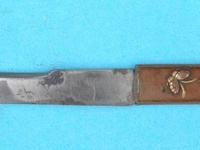 Part-gilt nigurome menuki, duck on a meadow. 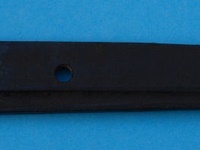 Corroded iron kozuka with brass phoenix application. 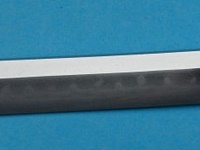 Blade shinogi zukuri, o kissaki, torii zori. 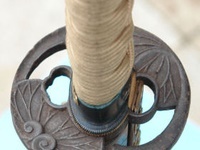 Bohi on both sides. Suguha hamon, masame itame hada, boshi not recognisable. 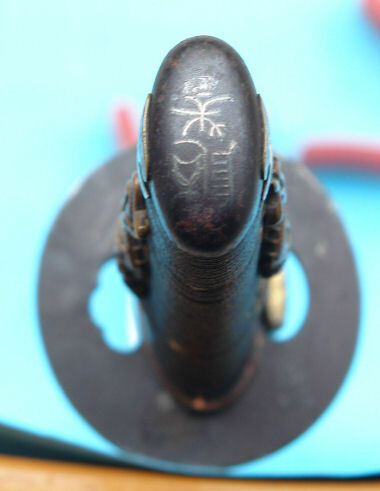 Small rust spots and scratches, signs of fatigue, two mekugi ana, kate sagari yasurime, uninscribed. 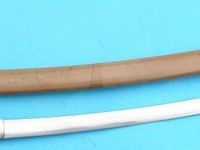 Copper habaki with nekogaki. 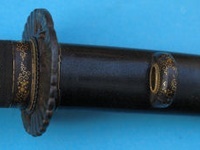 Ishime black laquer saya with the ume mon of the Maeda family in gold hiramaki-e. Iron handachi mounts.Higo work, scrolling leaves in gold nunome. 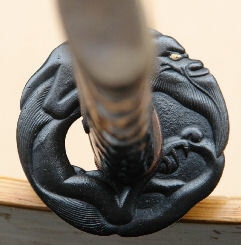 Marugata sukashi iron tsuba featuring a fan and ume mon design, Yoshiro work. 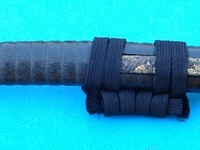 Tsuka fitted with same and mounted with a pair of part-gilt octopus menuki, black silk cord wrap. 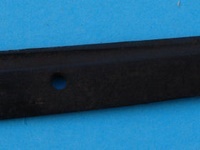 Kozuka missing. 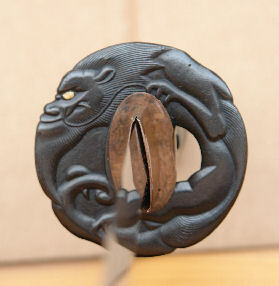 Mounting from the mid Edo period. 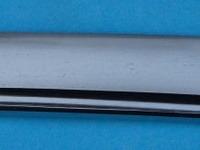 Length k/m 50,6 cm, total length 73 cm. 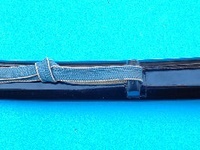 Blade shinogi zukuri, chu kissaki, torii zori. 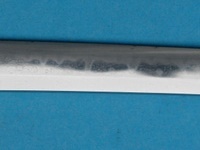 Sambonsugi gonome ashi iri hamon. Itame hada, mishina boshi, kaen with short kaeri. 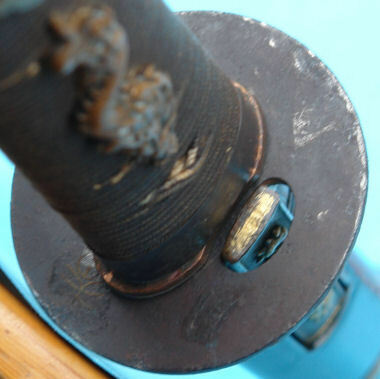 Small rust spots, kissaki damaged. 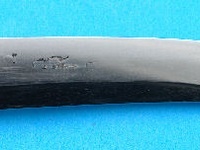 Nakago suriage, two mekugi ana, kiri yasurime, inscribed "Iga No Kami Fujiwara", cut off (probably kinmichi, KIN 46, 40 P.). 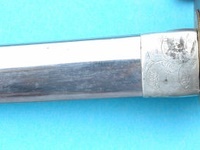 The reverse inscribed "Nihon Kaji Sosho". 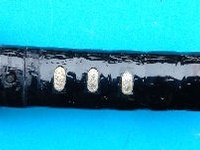 Shakudo covered copper habaki. 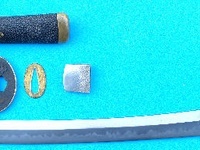 Black laquer saya with aogai flakes, iron fuchi kashira, Kaga brass zogan decorated with a design of honeycombs and a blossom. 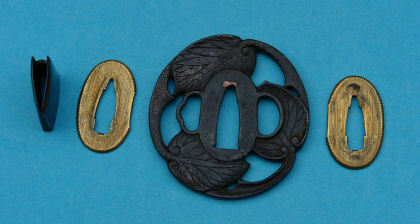 Nademarugata sukashi iron tsuba with aoi leaves, Kinai Echizen School. 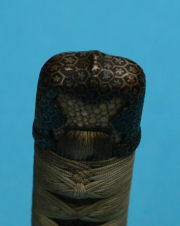 Tsuka fitted with same and mounted with a pair of part- gilt sode menuki, green-beige silk thread wrap. 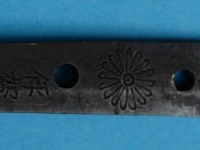 Iron kozuka with phoenix and kiri blossom, waribashi with blades of grass and blossoms. 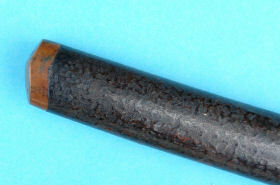 Mounting from the mid Edo period. 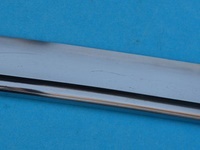 Length k/m 44,4 cm, total length 76,5 cm. 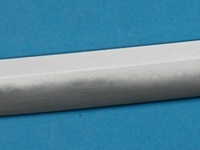 Ich kann über diese Klinge eigentlich nichts berichten ausser dass sie vertauscht wurde. 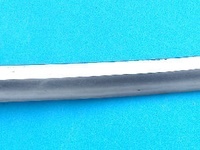 Meine gekaufte Klinge aus Japan wurde nach Kanada geschickt und diese Klinge hier sollte dem Kanadier geschickt werden. 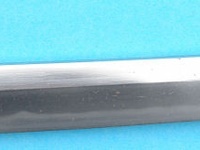 Die Klingen wurden vertauscht und ich hatte keine Chance mein Wakizashi zurück zu bekommen. Vielleicht sagen die Fotos etwas mehr aus. Die Klinge hat einen deutlichen Schmiedefehler; zu erkennen auf dem 5.Foto; sie hat noch eine alte Politur. 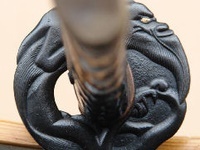 ein Kunde von mir war so freundlich und hat mir auf Grund seiner guten Fachkenntnisse die Schriftzeichen auf diesem Wakizashi gedeutet; die Mei lautet: „Biyou Osafune Ju“. Der Schmied Yokoyama hat so seine Klingen signiert. 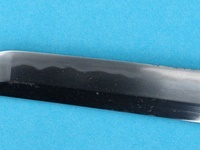 (Mit NTHK Papieren) ich gebe hier den beigefügten Text aus Japan wieder: Type: This early Edo blade is attributed to Owari Hata Mitsushiro, although the Meikan gives the reading as Mitsuo. The hatamitsuyo is a small school of shinto time not well know because of there small production and few blades subsiste now a days, they have produce powerfull blades. 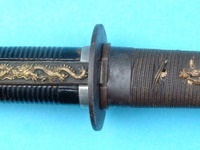 This sword is complemented with a nice koshirae, the saya is in excellent condition red roinuri, the tsuka has the original tsuka ito with original patina and kashira with face, the fuchi with gild was replace, 4 seppa and a double habaki gilded with yasuri ame and copper, a plain but nice iron tsuba, the blade is koshi zori shinogi zukuri with nume takeshi and raized shinogi-ji, taper toward the kissaki. 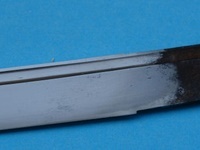 The blade is clean and polished there are a couple of small ware near the tang see pictures. 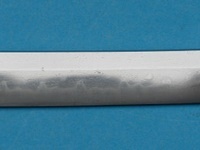 No Fatal flaws, great hamon Early Edo blade with papers, with koshirae, and no reserve, kambatte kudasai. 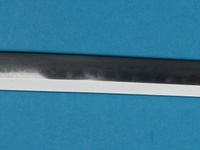 Japanese wakizashi sword. 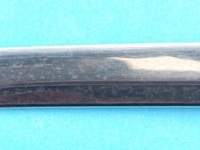 Artikelmerkmale Primary Material: Iron; Region of Origin: Japan Age: Pre-1800 Wakizashi sword in shirasaya. 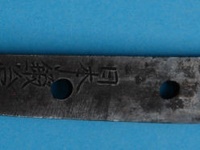 Age: Edo period. 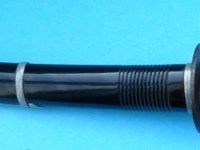 Condition: has a multiple flaws on the surface, old polish, guaranteed against hagire. 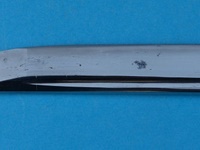 Cutting edge: 52.6 cm (20.7 inches.) 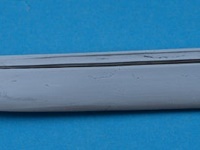 Nakago: 13.2 cm (5.2 inches.) 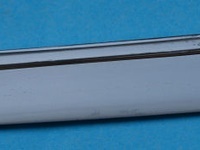 Motohaba: 28mm (1.1 inches.) 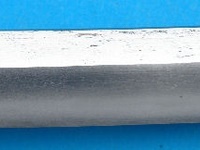 Motokasane: 5.5 mm (0.2 inches.) 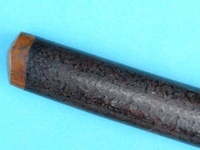 Sakihaba: 20 mm (0.8 inches.) 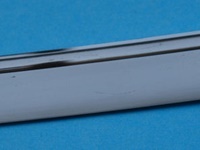 Sakikasane: 4.5 mm (0.2 inches.) Ein zusätzliches Papier wurde mitgeschickt (ich kann es aber nicht deuten). 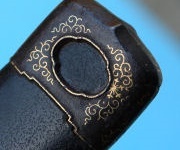 ....schade, es ist eine Klinge vor 1800 mit alter Politur; aber leider hat sie zwei sehr auffällige Schmiedefehler. Ich habe sie deshalb von 1.280,00 € auf jetzt 850,00 € im Preis gesenkt; mehr geht wirklich nicht! 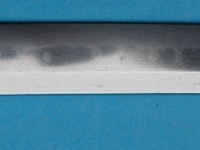 Japanese Samurai Edo Signed Wakizashi Sword in Koshirae Signed Kawachi Daijyo Fujiwara Yoshitane Artikelmerkmale Type: Swords Region of Origin: Japan Primary Material: Mixed Materials Original/Reproduction: Original Age: Pre-1800 *DESCRIPTION Product: Wakizashi sword in Koshirae Region of origin: Japanese. 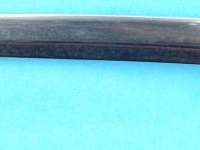 Original/Repro: Original Age: Edo period (17C) Total length: 63.2cm Weight:833g Condition: Ordinary antique condition with age appropriate wear and flaws Attachment: A Katana sack Japanese sword registration card that is effective only in Japan *There is no report and certificate attached to verify or guarantee this item. 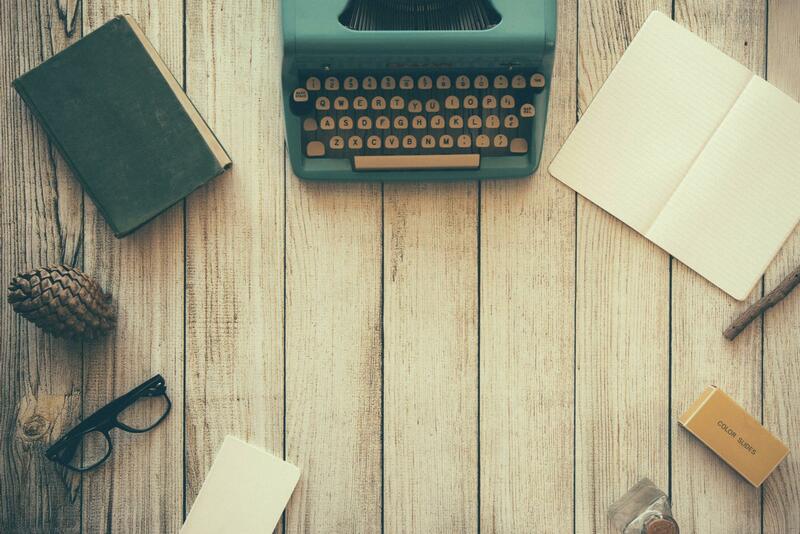 We do our best in writing our description. 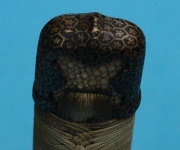 However, we sometimes overlook something. Most of the items are very old and not mint condition. They have age appropriate flaws. 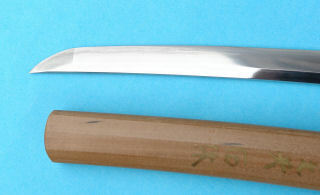 *ITEM'S FEATURES Blade Hacho: 38.5cm Motokasane: 0.4cm Motohaba: 2.9cm Sakikasane: 0.65cm Sakihaba: 2cm Sori: 0.7cm Material: Iron Hamon: Suguha Signature: Kawachi Daijyo Fujiwara Yoshitane Tsukurikomi: Shobuzukuri Condition: Old polished. 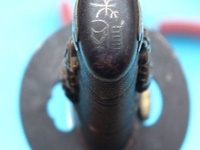 There are some Kitaekizu and Sabi (rusts) Overall ordinary antique condition with age appropriate wear and flaws. 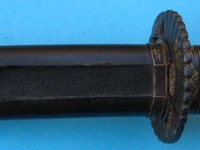 Koshirae Saya Size: 46 x 4.1x:2.1cm, 145g Sori: 1.4cm Material : Wood Condition: Repaired antique condition with age appropriate wear and flaws. 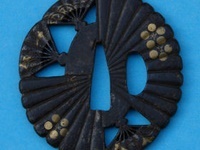 Decoration: Kuro Urushinuri Tsuka Size:16.8x 4x 2.2cm, 81g Material : Wood with inlaid brass Menuki (Kebori) Signature : Unsigned Condition: Ordinary antique condition with age appropriate wear and flaws. 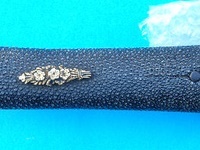 Fuchi Kashira (Fuchi) Size: 4x 2.2 x 0.8cm (Fuchi) Size: 3.7x 2 x1.4cm Material : Brass Signature : Unsigned Condition: Ordinary antique condition with age appropriate wear and flaws. 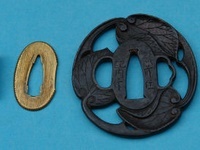 Tsuba (modern made, Showa period, no history value) Size: 7.3x 7.1x 0.3 cm 156g Nakago Size:2.8x 0.9cm Material : Copper Signature : Signed Condition: Good condition with age appropriate wear and small flaws. 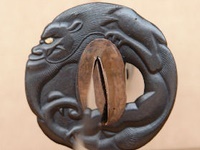 Decoration: Ryu zu (dragon) Seppa Size:4x 2.2 x 0.1cm 4g Size:3.9x 2.4 x 0.1cm 6g Material: Copper, copper with Ginbari Condition: Good antique condition with age appropriate wear and flaws. 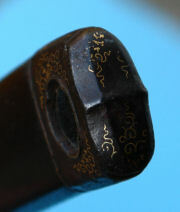 Habaki Size: 3.3 x 3.1x 1.2cm 31g Material : Copper Condition: Good antique condition with age appropriate wear and flaws. 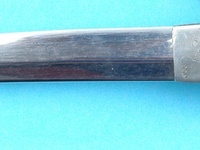 Japanese Samurai Koto Signed Wakizashi Sword in Koshirae and Shirosaya Signed Bizen Osafune Kiyomitsu (muromachi), Newly polished! 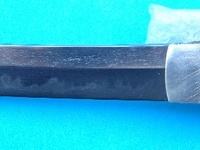 Description Product: Wakizashim sword in Koshirae/Shirosaya Region of origin: Japanese Original/Repro: Original Age: Muromachi Weight: 979g (Koshirae & Shirosaya) Condition: Good antique condition with age appropriate wear and flaws Attachment: Japanese sword registration card that is effective only in Japan Katana sack for each Koshirae 6 Shirosaya Item´s Features 1) Blade Hacho: 43,4cm; 391g Motokasane: 0,6cm Motohaba:2,8cm Sakikasane: 0,4cm Sakihaba: 2cm Sori: 0,7cm Material: Iron Hamon: Suguha Signature: Bizen Osafune Kiyomitsu Tsukurikomi: Shinogizukuri Condition: Newly polished. 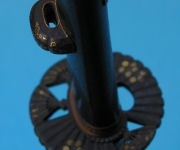 No serious damage, overall very good antique condition with age appropriate wear and tiny flaws. 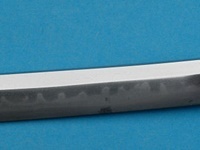 This is a beautiful blade with great Suguhamon! 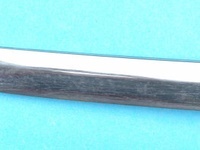 1) Koshirae This is a fine Koshirae with beautiful fittings. 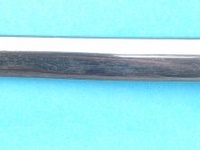 Not original Koshirae for the blade but fits well with the blade. 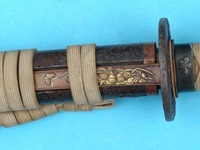 (Total size including blade) Size: 67,8cm; 743g Saya Size: 51 x 3,8 x 2,1 cm ; Weight: 174g Sori: 0,9cm Material: Wood Condition: Good antique condition with age appropriate wear and tiny flaws. 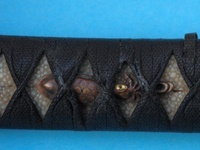 Decoration: Ishimeji Kawari urushinuri (repainted) Tsuka Size: 16 x 3,7 x 2,1 cm; Weight: 88g Material: Wood, Shark skin, black thread Signature: Unsigned Condition: Some damage of shark skin with age appropriate wear and flaws. 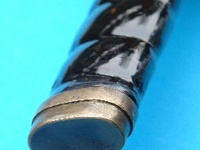 Issaku Fuchi Kashira Fuchi Size: 3,7 x 2,1 x 1cm Kashira Size: 3,2 x 1,6 x 0,7cm Material: Shakudo Signature: Unsigned Condition: Very good antique condition with age appropriate wear and tiny flaws. 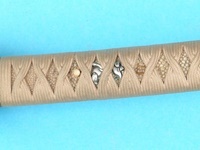 Technique: Nanakoji Takahorizogan Iroe Decoration: Kuge zu (court noble) This is a great pair of Fuchi Kashira depicts court noble by excellent carving in details! 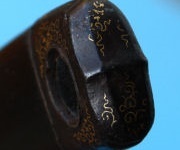 Issaku Menuki Size: 5,4 x 1,2 x 0,4cm (approx) Material: Shakudo Signature: Unsigned Condition: Very good antique condition with age appropriate wear and tiny flaws. Technique: Katahori Kiniroe Decoration: Kiku zu (chrysanthemum) This is a great pair of Menuki decorated with beautiful chrysanthemum by excellent carving! 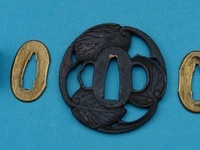 Tsuba (around Bakumatsu to Meiji) Size: 6,6 x 6,6 x 0,5cm; 65g Nakago Size: 2,7 x 0,8cm Material: Iron Signature: Unsigned Condition: Good antique condition with age appropriate wear and tiny flaws. 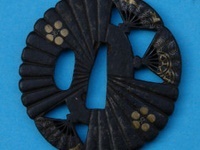 Technique: Sukashi Decoration: Tsurumaru (crane) This is a nice Tsuba decorated with Tsurumaru sukashi, traditional crane design! 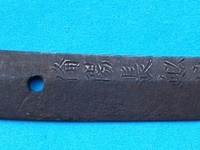 Seppa Size: 4,1 x 2,5 x 0,1cm; 2g Size: 4,0 x 2,2 x 0,1cm; 2g Material: Copper Condition: Good antique condition with age appropriate wear and tiny flaws. 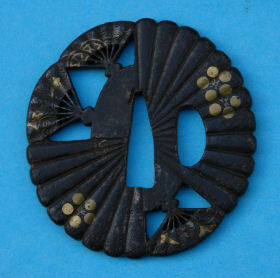 Habaki Size: 3,1 x 2,4 x 1,2cm; 20g Material: Copper with ginkise (silver) Condition: Good antique condition with age appropriate wear and tiny flaws. 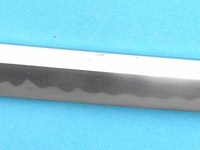 This is a beautiful decorated Habaki with ginkise (silver) 2) Shirosaya Total size including wooden blade: 72cm; 236g Newly made wooden blade (hontsunagi) Hacho: 45,5cm Motokasane: 0,5cm Motohaba: 2,5cm Sakikasane: 0,3cm Sakihaba:2cm Sori: 0,8cm Saya Size: 54 x 4,1 x 2,2cm; 144g; Sori: 1,5cm Material: Wood Signature: Unsigned Condition: There is a thin crack but overall good antique condition with age appropriate wear and tiny flaws. 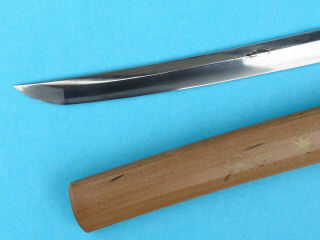 Tsuka Size: 18 x 4,1 x 2,2cm; 62g Material: Wood Signature: Unsigned Condition: Good antique condition with age appropriate wear and tiny flaws. 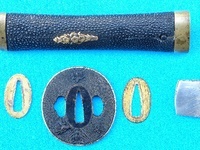 Hacho: 29,8 cm; Motokasane: 0,6 cm; Motohaba: 2,9 cm; Sakikasane: 0,4 cm; Sakihaba: 1,9 cm Sori: 0,3 cm; Tsuba: Iron, signiert Bushu ju Kanenaga (we cannot guarantee the signature as it has not been appraised by NBTHK); Tsukurikomi: Hirazukuri Condition; old polished. 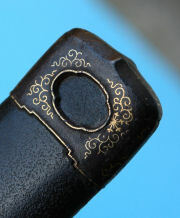 There are some small Kitaekizu but overall very good antique condition with age appropriate wear and flaws. Great Notare hamon!!! 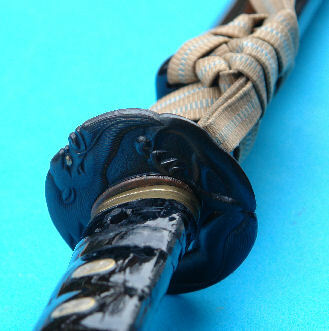 Koshirae Size: 36,8 x 4,1 x 2,2 cm: Decoration: Kuro Urushirnui. 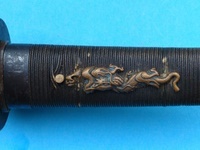 Issaku Menuki Size: 3,6 x 1,5 x 0,4 cm(approx); Material: Shakudo. 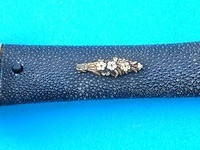 This is an excellent pair of Menuki depicts flower in a pot by fine carving! 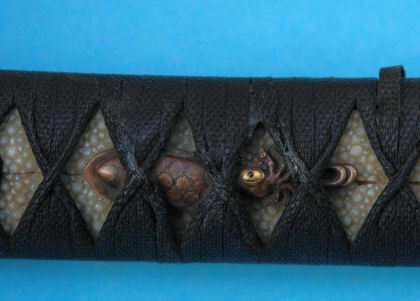 Issaku Fuchi Kashira (Fuchi) Size: 3,7 x 2,0 x 1,1 cm; Kashira Size: 3,4 x 1,7 x 0,5 cm; Technique: Sukidashibori; Decoration: Kiku zu (chrysanthemum); Signed Tsuba Size: 6,6 x 5,87 x 0,5 cm; Nakago Size: 2,7 x 0,7 cm (04, cm thickness; Material: Yello copper; Technique: Aishishibori sukashi; Decoration: Uryu zu (dragon): Seppa: Material copper; Habaki Size: 3,2 x 2,1 x 1,1 cm; Material: Copper Technique: Sukashi; Decoration: Gengi guruma zu (traditional Japanese pattern); this is a beautiful Habaki decorated with traditional Japanese design by fine Sukashi!